Another first with Baxter: a snow day! Would any of you be surprised if I told you Baxter wasn’t exactly a fan of the snow? He was (as expected) pretty funny exploring this new white powdery stuff that – he was rather frustrated to report – was nothing yummy and pretty darn cold. 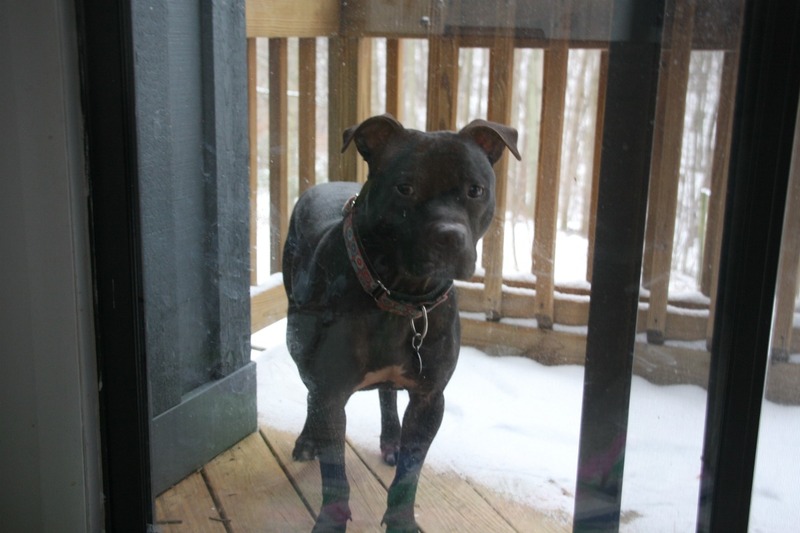 He also raised protest when he realized access to the backyard was restricted thanks to a long set of snowy stairs. Crap. 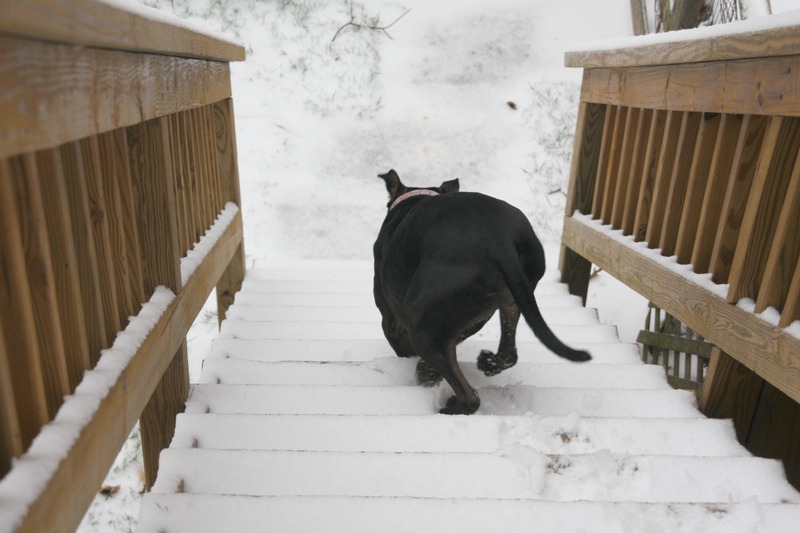 Bax knows that fostermom won’t let him back in the house until he does his business, so he bravely made his way down the wintry steps. And then he decided that for one quick minute he liked the snow, and he did a zoomie. 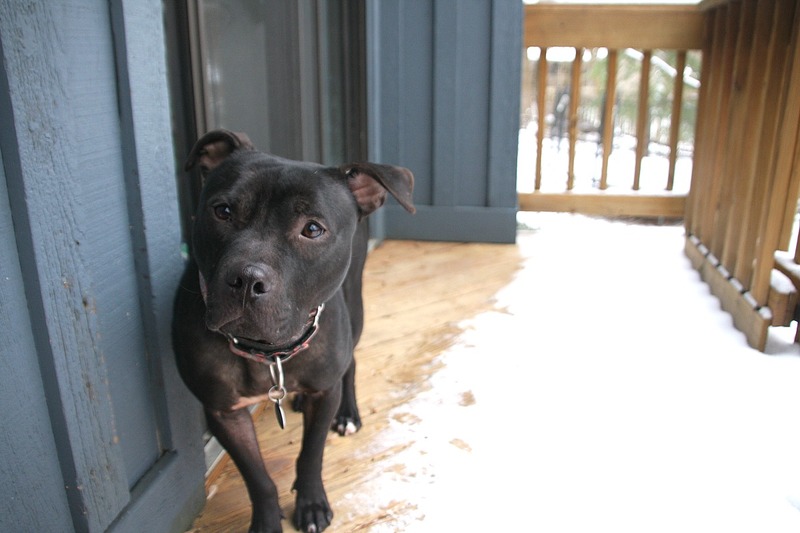 But that was merely a brief moment of confusion on Baxter’s part, and he quickly remembered he didn’t like the snow and that he wanted to be inside the toasty house. He was much happier to come inside and do what he does best while the humans snuggled on the couch with hot chocolate. It ended up being the perfect snow day. Don’t you want someone like Baxter to spend your snow days with? 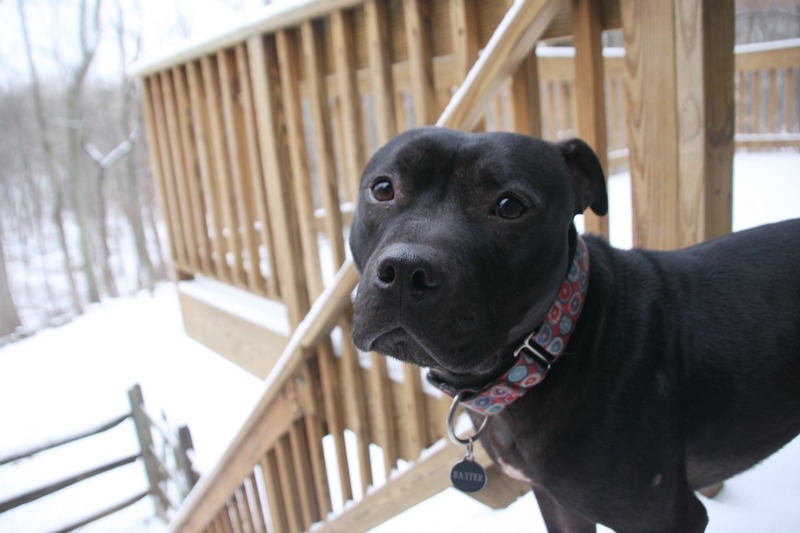 This entry was posted in Baxter, Dog talk, Rescue/Humane Society and tagged Baxter, black dog, for adoption, fostering, pit bull, playing, snow, snow day. Bookmark the permalink. 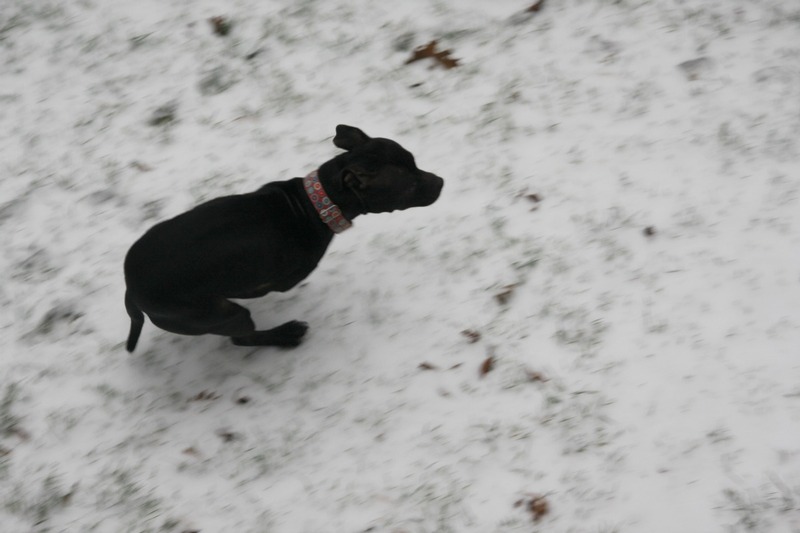 I think 1 zoomie is very brave – I hate snow too! Turk does the EXACT same thing the first time it snows every year. One zoomie, then straight back into the house….do you think he taught that to Baxter? This dog is sweetness. The pleading looks, the stoic journey down the steps, the return to warmth. i need to do a zoomie (then take a nap). might cheer me up! Having a snow dog makes staying inside with hot chocolate on a snow day pretty hard around this house- currently in envy! Love the zoomie! Mel and Nemo are sort of “meh” about snow, but Heidi got very excited and did a few zoomies and then started to eat as much snow as possible, haha. aww. 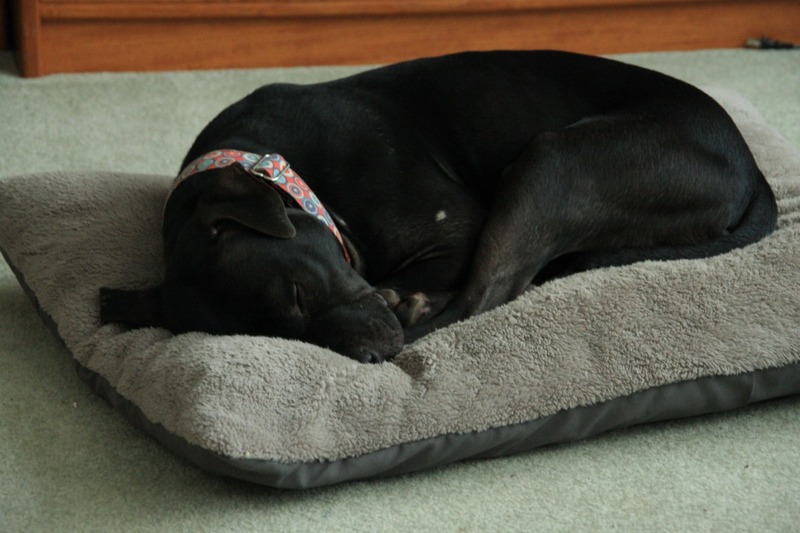 he’s so sweet sleeping on his little bed. I love that he checks in with you at the top of the stairs to see if he is doing the right thing … you can tell he really works hard to be a good boy! Bax is just the cutest. My fingers are crossed for him!! Does he still have a possible adoption pending?